Forward-thinking building owners and developers are using social media sites like Instagram to attract increasingly tech-savvy workforce and residents. While traditionally the commercial real estate industry has not looked to marketing on social media sites, the trend has been gaining attraction as more commercial real estate owners attempt to lure professionals to their properties. In today’s fast-paced world, building a brand is about getting as much marketing as possible and Instagram, which remains the fastest-growing social media platform in the world, has become a hotbed for visual images used to market products in the other luxury industries such as restaurants and hotels–now the CRE community can also make significant strides using a similar approach. Millennials are using Instagram more than any other platform. Research by Pew shows that 60% of Instagram’s users are between the ages of 18 and 29, with 42 % of those users visiting the site at least once per day. These are the same demographics which describe today’s workforce and with that many eyeballs, building owners simply cannot ignore this often untapped customer base. Multi-residential property owners like Jersey City’s Urby are using the platform to market to and through prospective tenants who post experiences on their Instagram. Urby has nearly 16,000 followers on its social media platform which now serves as a marketing funnel for the company to find renters. While residential marketers primarily real estate agents have already jumped on the Instagram bandwagon, commercial real estate professionals have been slower to climb aboard, according to the Brower Group a commercial real estate content and marketing agency. Part of the resistance from the commercial real estate sector has been that allowing entrée to just anyone might impact the exclusive nature of their products and services product- but platforms like Instagram, which has more than 100 million active users in the U.S. alone, has served other industries like hotels and restaurants well and now savvy developers and architects are jumping on the bandwagon. But the simple fact is that images are essential to commercial real estate marketing. As an image-based platform, Instagram is a tool that commercial brokerages, asset managers and financiers should no longer ignore, according to the Brower Group. 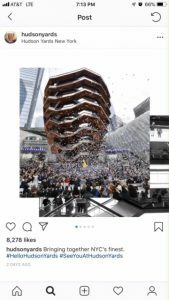 Hudson Yards, the most expensive and largest private real-estate development in the history of the United States, houses a collection of luxury shopping centers, restaurants, apartments and office buildings on Manhattan’s west side and has used the site to market the development’s progress and recent opening through posts and videos on Instagram and has more 70,000 Instagram followers. Commercial real estate brokerages CBRE, JLL and Cushman & Wakefield each with upwards of 30,000 followers have already realized the brand value of gained from social media. While the majority of social media Instagram posts are not a means of closing a direct sale when it comes to building a brand social media sites provide a snapshot of what it’s like to work or live in a building and can serve as an effective means of competitive differentiation for building owners. Testimonials from tenants can paint a real-life picture of what it’s like to live and work in the area highlighting the area’s accessibility to local restaurants, health clubs, parks, and schools. Whether its a search for new workspace or a luxury apartment, customers are turning to the internet first for information and building owners who want to increase their brand awareness and remain competitive in a digitally empowered world must be willing embark on a social media strategy.